Class 2 Clustered Regularly Interspaced Short Palindromic Repeat (CRISPR) systems, which form an adaptive immune system in bacteria, have been modified for genome engineering. Prior to CRISPR, genome engineering approaches like zinc finger nucleases (ZFNs) or transcription-activator-like effector nucleases (TALENs) required scientists to design and generate a new nuclease pair for every genomic target. Due to its comparative simplicity and adaptability, CRISPR has rapidly become the most popular genome engineering approach. 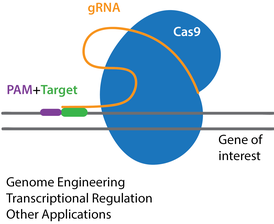 Engineered CRISPR systems contain two components: a guide RNA (gRNA or sgRNA) and a CRISPR-associated endonuclease (Cas protein). The gRNA is a short synthetic RNA composed of a scaffold sequence necessary for Cas-binding and a user-defined ∼20 nucleotide spacer that defines the genomic target to be modified. Thus, one can change the genomic target of the Cas protein by simply changing the target sequence present in the gRNA. CRISPR was originally employed to knock out target genes in various cell types and organisms, but modifications to various Cas enzymes have extended CRISPR to selectively activate/repress target genes, purify specific regions of DNA, image DNA in live cells, and precisely edit DNA and RNA. Furthermore, the ease of generating gRNAs makes CRISPR one of the most scalable genome editing technologies. This advantage makes CRISPR perfect for genome-wide screens. This guide will provide a basic understanding of CRISPR biology, introduce the various applications of CRISPR, and help you get started using CRISPR in your own research.